The Golden Dragon, currently playing at Tarragon Theatre, is a well executed piece of theatre that will make you laugh, cringe, and think about stuff you wish wasn’t really happening in this world. If you like your theatre in the form of traditional linear storytelling, with realistic costumes and characters, a play you can ‘lose yourself in’, this will not be a show for you. You will never forget that you’re watching a play. If the cross-gender, cross-age and cross-ethnicity (is that a term?) characters doesn’t pull you out of the experience enough, then the spoken stage directions and occasional ‘nudge-nudge-wink-wink’ type of action to the audience will. The script is written by Roland Schimmelpfennig, who is also the author of Peggy Picket Sees the Face of God (which was one of the plays in Another Africa) another piece that doesn’t fit into the mould of traditional linear theatre. His style is certainly evident in the script of The Golden Dragon, although the piece is completely different. While the Peggy Picket Sees the Face of God is a contained piece, the entire piece taking place in one room, with only four characters, The Golden Dragon has many characters and many settings and feels a bit, for lack of a better word, looser. If someone on the street asked me to describe the show I’d say “well, it has a lot of elements that feel a bit like a farce, you know, if farces included heartrending sexual abuse.” I guess what that translates to is a show that is funny, but certainly not comfortable. It’s challenging. I think challenging is a good thing, it makes things more interesting, more striking, and more memorable. I would be remiss if I didn’t mention the wonderful design of the show. Teresa Przybylski’s set was terrific. The ‘stage’ runs through the middle of the audience, much like the runway of a fashion show, without the entrance leading to it. It is comprised of a long clean white blank rectangular structure, about three feet tall, with drawers of different sizes making up its walls. These drawers contain props, costumes, even stairs. It was a wonderful use of the space, and created a fantastic canvass for the wonderfully evocative lighting design by Thomas Ryder Payne. The juxtaposition of the very non-realistic nature of the piece against what felt like some very realistic lighting choices added some great texture to the piece. When it was winter, I actually felt cold. The table in the dark room of the apartment lit only by a streetlight, felt exactly as it has for me in a similar setting. I was disappointed that my show-partner for this one had to cancel at the last minute, not only because it means he’s feeling sick (get well soon!) but also because this is exactly the type of show that I wanted to have someone to talk to about. There’s so much in the piece, I want to hear the experience from another perspective, I want to see where our experiences mesh and where they diverge. So, with that said, I highly recommend when you check this out, you bring a friend and make time for a coffee or a pint afterwards. I’m betting you’ll have some interesting conversation. 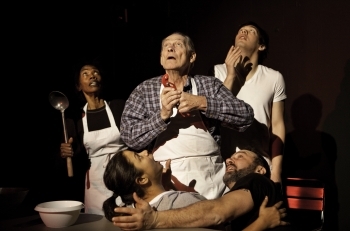 You have until February 19, 2012 to see this funny, striking and difficult piece of theatre. Photo credit to Cylla von Tiedemann. In photo: Anusree Roy, Tony Nappo, Lili Francks, David Fox, David Yee. Oh, and, it also made me desperate to make a preventative dentist’s appointment. You’ll understand when you see the show. Nice review! I just wanted to correct an error – the lighting design was by Rebecca Picherack, not Thomas Ryder Payne. Thomas did the sound design. Many thanks for pointing that out. That’s what comes of writing while sleep deprived I guess… I’ll make the change as soon as I have access to a computer again.